In the Carpathian Mountains, indicated on the map above, the European wildcat mainly feeds on the yellow-necked mouse, red-backed vole (see photo2) and bank vole. Due to its relatively short legs, the European wildcat is not suited to walking in deep snow and so are restricted to areas where snow is no more than about 10 to 20 centimeters in depth. Wildcats will move to lower territory in winter to avoid heavy snow. They are not normally found in the “subalpine belt” (pre-mountainous belt), coniferous forests and “spruce taiga”. Spruce is a coniferous evergreen tree looking like a large Christmas tree. A “taiga” is an ecosystem or community of plants and animals. Wildcats mostly hunt on the ground but are very good climbers inline with all cats. They generally hunt at night. They hunt by watching and waiting or travelling slowly and silently throughout their territoty, watching and listening for prey. Once prey is located it stalks it using a low stalking run while using available cover. Once within strike range the European wildcat darts forward and strikes. As is the case with domestic cats, the killer bite is to the nape of the neck (back of the neck), severing the spine of the prey. Prey is usually a rodent. They also prey on larger animals such as rabbits and hares; even young deer1. In Scotland the wild cat preys on rabbits; in spring this means young rabbits that are available. Less commonly it preys on shews and birds. 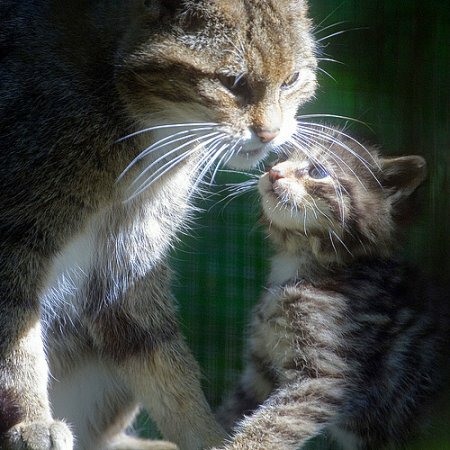 Being an inherently adaptable animal the European wildcat will also eat insects, frogs, fruit, fish, martens, polecats and weasels amongst other animals. The European wildcat is also liable to be involved in eating poultry and even cat food left out for domestic cats. 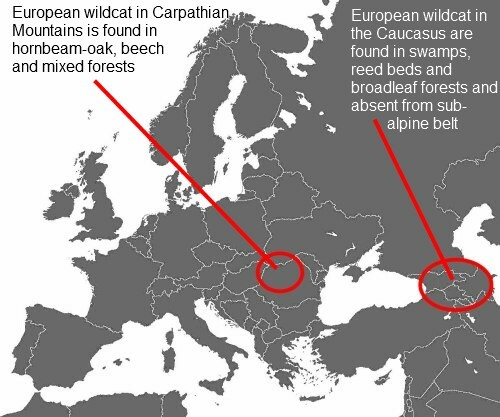 Who preys on the European wildcat? Answer larger carnivores such as the Eurasian lynx. 2. Wikimedia Commons file uploaded by user Bluemask.